Small Skull  - $13.99 : Mystic Crypt, the most unique, hard to find items at ghoulishly great prices! Small Skull is meticulously crafted from cold cast resin and hand painted. This skull looks quite similar to a human skull, only miniaturized. Made from cold cast resin, this attractive figurine has been hand-painted to give it a bony yet weathered look that makes this skull small on size but big on character. 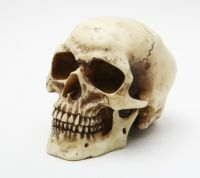 This skull has a classic and realistic design, featuring patches of weathered bone and a few distinct suture lines where the bones of the skull can be seen. 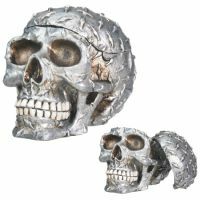 Due to this skulls small stature, it is the perfect size to go virtually anywhere, be it on a shelf, a desk, a counter, or any other place where a skull might be displayed. 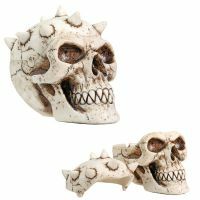 The Small Skull makes a great addition to any fantasy or gothic decor, as well as a fantastic gift to anyone who loves or collects skulls of any sort. Measures 3 1/2 tall inches X 3 1/2 inches wide X 4 3/4 inches in depth.